Well - this trip we be from March 2009 - September 2009. My plan is to bicycle cross the states - from NY to LA. The trip will be done on a BROMPTON-bicycle. Will ofcause try to make it both up- and downhill from the harbourh and up the mountain - most likely the hardest hill for bicycles in the world. Flying from LA - Copenhagen. The trip will be in my summerholiday. The plan is to drive at least 100km/ day - or apx. 60miles. On the trip over the states - I'll be stopping in on this page and write of the experience I've been making on this trip. I'll be writing a tour-guide of the problems u can or will run into on a tour like this one - the flora and other sites or usefull ideas that everyone needs to know before making a trip like this. I've been talking to some bicycle-enthusiats that have recomended me on some bike-ideas to this trip. I'm also outlooking for sponsors on the trip. 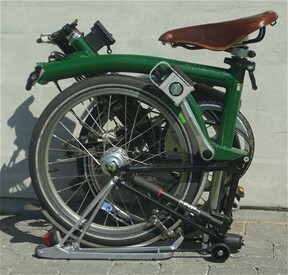 The BROMPTON-bike is the most convenient bike for everyone - old and young - 'cause u can take it with u whereever u go.